Product #438 | SKU Z-DM3 | 0.0 (no ratings yet) Thanks for your rating! 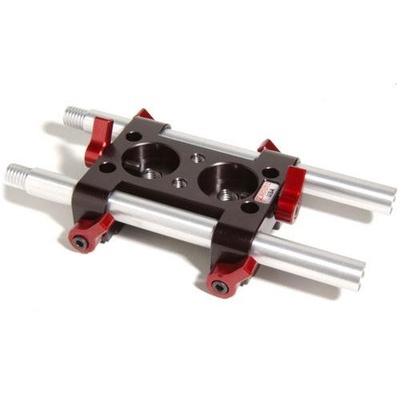 Zacuto is the first to invent a device that comes off the back of a baseplates rods. This invention allows us to balance front heavy camera packages while adding mounting options for articulating arms, wireless plates and 12 volt battery power. The DoubleMount has hardened steel helacoiled sockets which prevent cross threading and will hold up to 4 articulating arms; two 3/8 16" & two 1/4 20" articulating arms all at once. The DoubleMount can also accept two Z-Release (quick-release) Zamerican articulating arms , when you add two Zround Mounts. You can also retrofit you existing arms to be Z-Release (quick-release) by adding either a 3/8 16" ZUD or a 1/4 20 ZUD which also mount into our Zround Mounts. By adding a Zacuto Red Plate , which screws into a Zacuto DoubleMount and a battery plate, which screws into a Zacuto Red Plate; you can then attach 12 volt batteries that can power all of the camera accessories.